PROM COURT MEMBERS: Make sure all your fines are paid, stop by Ms. Lopez's room (D212) for your sash or crown, and have your Court Bio completed by this Friday, April 26. IF YOU ARE INTERESTED IN BEING A CLASS OFFICER NEXT YEAR, petition forms are available in the Activities Office beginning today, April 22. SCHOLARSHIP DEADLINE: The PNEA and Sheila Webb Scholarships are due today, April 22. See Mrs. Kuhn with any questions. STUDENTS THAT GET COMMUNITY SERVICE FOR WATCHING THE PLAYSCHOOL KIDS DURING FIRST LUNCH: Please be on time today and tomorrow (April 22 & 23)! TODAY (APRIL 18) WE HAVE CONTACT TIME DURING HOMEROOM. Operation Prom Safe for Juniors and Seniors has been canceled. Please remain in your Homeroom class while announcements are being read. Also, students attending Contact Time meetings and activities are required to have a pass. There should be no students in the hallways during Contact Time without a pass. THERE IS NO SCHOOL TOMORROW, APRIL 19 due to a Spring Holiday. SENIORS: Jostens will be here today, April 18 in the gym lobby during all lunch sessions to deliver Senior Announcements. SENIORS: Complete the Senior Survey on Naviance for your Senior Awards Night and Graduation information. Questions? See Mrs. Luraschi. SENIORS: Jostens will be here tomorrow, April 18 in the gym lobby to deliver Senior Announcements. THERE WILL BE NO SCHOOL THIS FRIDAY, APRIL 19 due to a Spring Holiday. THE ENGINEERING CAREERS LUNCH is today, April 17 at 11:30am. in room B104. STUCO STORE will be closed today, April 17 during all lunches. THERE WILL BE A FASHION SHOW during all lunch hours today, April 17, showcasing some of the Prom dresses available for loan from Pirate Pete's Closet. JUNIORS: Attend the College Kick Start Workshop on How to Apply to College tomorrow, April 18 from 1:30-2:15pm. in the College Center. There will be food & a chance to win a $50 gift card. LAST CALL! JUNIORS WHO ARE 1ST GENERATION COLLEGE BOUND: Turn in your College Academy applications by tomorrow, April 18 to Mrs. Luraschi. STUDENTS THAT EARN COMMUNITY SERVICE HOURS BY WATCHING THE PLAYSCHOOL KIDS DURING 1ST LUNCH need to make sure and come today, April 16. COLOR GUARD AUDITIONS are this week (April 15-19) from 6-8pm in the Main Gym. 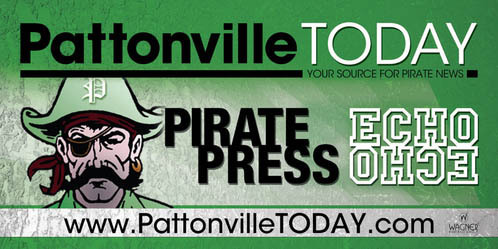 Students will learn and perform with the Marching Pirates in their 2019 Fall Season. No experience is necessary, but a background in dance, theatre, or gymnastics is always welcome. Come dressed to dance and bring a friend; sign-up lists are posted by the Band Room. We hope to see you there!! COME SEE THE ONE-ACT PLAYS tonight, April 16 at 7pm in A213. Tickets are $3 and can be purchased from Ms. Corvera or at the door.